The Artisan Titanium Comfort Ring Core is so lightweight, you’ll hardly notice you’re wearing a ring at all. Known for it’s use in aerospace, military and the medical industry, Titanium is biocompatible meaning it won’t cause an allergic reaction no matter who wears it. 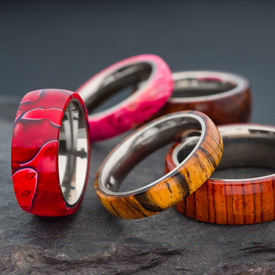 And, like our standard Artisan Comfort Ring cores, it features a rounded interior profile that makes it comfortable to wear and won’t pinch. Comments On Feb 16, 2019:I have used a few and really like them because they are thinner than the stainless steel ones. They allow thinner rings and I like that. I measured the difference but don't recall the exact difference, looks like about half as thick at the edges.